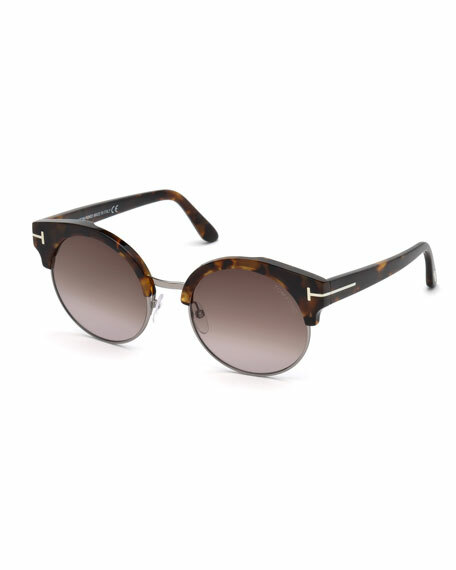 TOM FORD "Alissa" semi-rimless sunglasses in metal and plastic. Round, gradient lenses; logo script. Signature "T" detail through temples. Krewe "St. Louis" round sunglasses in handcrafted acetate with 24-karat, gold-plated hardware. Lens/bridge/temple (in mm): 46-23-145. Round gradient lenses. Compressed double nose bridge with screw detail. Peaked frame front with linear studs. 100% UVA/UVB protection. Can be fitted with prescription lenses. Imported.